What a fantastic Vuelta which maintained the suspense right up until the final summit on the pen-ultimate day. But the “Shark”, having gotten his teeth into the red jersey (again) wasn’t going to be shaken loose and he managed to claw (not that sharks have claws) his way back onto Mosquera’s wheel. As a consolation, Mosquera won his first Grand Tour stage while Nibali sealed the leader’s and combined jerseys. As predicted (by me and pretty much everyone else), Cavendish won the points and Moncoutie the mountain’s. Consolation for Joaquin Rodriguez as he has now climbed atop the UCI rankings. 1) Denis Menchov, 2nd in the time-trial, who finished 41st on GC. Clearly, despite nicking 3rd spot in the Tour thanks to his performance in the time-trial from my beloved Samu Sanchez, it took more out of Denis than anyone realised. He woz rubbish! 2) Peter Velits on the podium – no one saw that one coming. HTC-Columbia’s first GT podium. The Velits twins and Peter Sagan: don’t mess with Slovakia. 3) Some consolation for my beloved boys in orange: 3 stage wins and Mikel Nieve’s 12 place on GC. All good omens for 2011. 4) David Moncoutie’s mountains jersey (3rd consecutive) and his re-signing for another (final?) year with Cofidis. 5) He’s on his way back from the wilderness: Andrey Kashechkin’s 18th place on GC in his first real ride in 3 years. 6) Christophe Le Mevel’s 15th place on GC: some consolation late in the season. 7) Nico Roche 7th on GC: clearly a chip off the “old block”. 8) Jan Bakelandts 19th on GC: keep an eye on him. 9) Will he, won’t he? Fabulous Fabian jumps ship, leaving both SaxoBank and the Vuelta in the lurch. He may not even go to the World’s after being beaten by both Velits and Menchov in the Vuelta ITT. The SaxoBank cupboard is starting to look rather bare. 10) Using the Vuelta as a predictor of form for the World Championships, you have to say watch out for Philippe Gilbert in Geelong. What more can I say? A brilliant 3 weeks of racing, much appreciated by the viewing public, whether on the roadside or in front on the screen. In fact the lack of some of the bigger names may have made the outcome, and the racing, less predictable. It also helped that the Vuelta finished 2 weeks before the Men’s Road Race at the World Championship’s in Melbourne. Full credit must go to the organisers, Unipublic, for staging what most people feel is the best Vuelta in a long time. Long may it continue. Pressing matters down at the cycling club have meant I’ve been mostly catching the evening highlights of the Vuelta rather than live coverage. This also means that I’ve made no inroads into the “To do during the Vuelta” list. Nonetheless, it’s proving to be a gripping contest and I’m hoping for more viewing time next week. Tuesday’s stage 10, 175.7km from Tarrgona to Vilanovi la Geltu started without Schleck the younger and hard man Stuart O’Grady. The two had been sent home by SaxoBank Team boss Bjarne Riis for breach of team rules. They had allegedly returned to the hotel at 5:00am that morning after a few alcoholic beverages. Probably, bang went any chance that Frank might have (still) entertained of a podium placing. The stage was won by one of the day’s breakaways, Imanol Erviti (Caisse d’Epargne) who caught his fellow escapees napping on the descent of the Rat Penat. The red jersey changed hands after Purito, riding into his home region of Catalonia, had hoovered up a couple of bonus seconds earlier in the day. On Wednesday, Igor Anton sand-bagged his way to a second stage win (and back into the leader’s jersey) into Andorra. He had timed his come-back to perfection after he looked to be distanced by the attack of Ezequiel Mosquera, who finished 2nd) and Vicenzo Nibali on the final ascent of the day. Despite going with the initial attack, Purito lost a minute on Anton but the biggest loser was Denis Menchov who finished 56th, over 5 minutes down. Clearly, the Tour took more out of him than we realised: bye-bye podium. Stage 12 from Andorra la Vella to Lleida was one for the sprinters. The only other time the Vuelta had visited Lleida, the stage was won by Malcolm Elliot, still the only Brit to win a points jersey in a Grand Tour and, more amazingly, who’s still racing, against men half his age, on the British Premier Circuit. So it was only fitting that the race was won at a canter by the Manx Missile whose team had done their homework on the run in. His poisson pilote, Matt Goss and he read the final corner beautifully and they came out of it several bike length’s ahead of everyone else. He now joins that short list of 5 men who have won sprint stages in all three Grand Tours and he’s back in the points jersey. Stage 13 to Burgos was more of the same, another win for Cavendish, who had enough time to bunny hop over the line. Again, he and Goss read the last corner better than the rest and finished well in front of the also rans. As Cav so eloquently put it in his post-race interview: it is indeed better to have a star team than a team of stars. It’s easy to see that Cav has a much lower trajectory on the bike than the other sprinters which makes him more aero-dynamic, not forgetting, of course, his 5th gear. My favourite moment of the day was a bunch of slightly overweight Basques decked out in orange (of course) and time trial helmets trotting in single file alongside the peloton, clearly enjoying their 15 seconds of fame. Hours before the start of the 65th edition (and 75th anniversary) of the Vuelta a Espana, I’m all set and raring to go. Unusually, there’s no pile of laundry to keep me occupied when I’ll be whiling away my afternoons in front of the television. No, I’m going to be sorting out my dressing room, all the drawers and cupboards in the lounge and dining room and rearranging my collection of cookery books. If you’ve visited my apartment you’ll know that these are all mammoth tasks befitting a three-week Tour. Many more gifted than me have previewed at length the fancied riders and the stages. I’m not going to add to this. Instead, you’ll get, as usual, my take on things: less objective, more subjective. A consensus seems to have built up around perm any three from Nibali/Menchov/Mosquera/the Schlecks/Arroyo/LL Sanchez/Sastre/Rodriguez. The Vuelta organisers were hoping to tempt Contador to his home Tour and devised a parcours which would suit him. As he’s shown, it’s possible to do the Giro/Vuelta double, but it’s much more difficult to double up with the Tour de France. It’s not so much the racing itself more the mental demands. In addition, he had concerns over the quality of his support. Valid concerns if you look at the Astana team sheet. My favourite Spanish rider, Samu Sanchez will also be missing, as will last year’s winner, Alejandro Valverde, who’s on an enforced sabbatical. As a consequence, Inigo Cuesta, of the soon to be defunct Cervelo Test Team, riding his 17th consecutive Vuelta, will be honoured with the No 1. 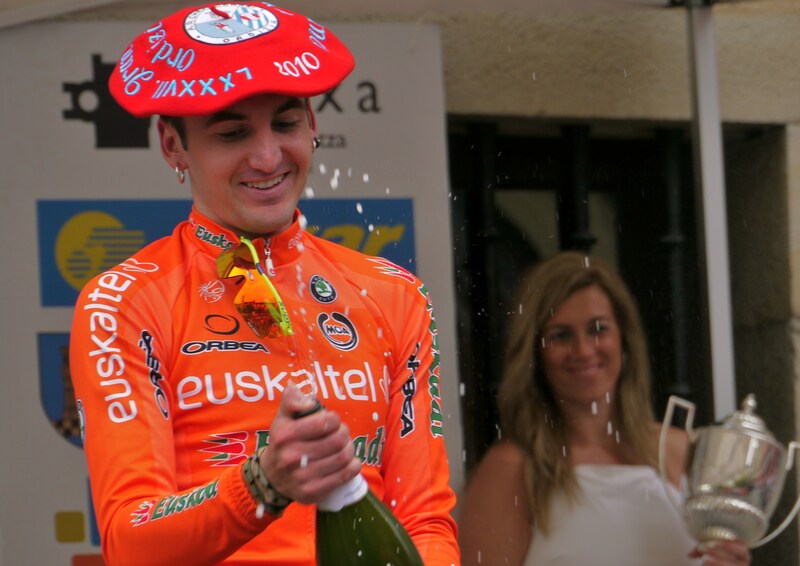 While it’s rare for there to be surprises on the podium of a Grand Tour, I am hoping that maybe either Igor Anton or Benat Intxausti, both from Euskaltel-Euskadi, will shine in their home tour. It’s also an opportunity to look out for talent of the future (Tony Gallopin and Arthur Vichot) and talent that’s shone over the past two seasons, to shine more brightly (Tejay van Garderen and Ben Swift). Of course, there will also be a whole host of riders, without contracts for next season, looking to catch the eye of a Directeur Sportif or two. And, let’s not forget, a whole slew of sprinters, in fact pretty much everyone bar every girl’s favourite bad boy, Tom Boonen, who’ll be battling for supremacy over a possible 8 sprint stages, ahead of the World Championships in Melbourne. So, stand by your television sets for this evening’s 13km team time trial around Sevilla. Footon-Servetto are off first with teams going at four minute intervals. Local team, Andalucia-CajaSur, will go last. SaxoBank have the advantage of going after other potential winners HTC-Columbia, Garmin-Transitions and (remember the Giro), Liquigas. I do not anticipate any decisive time gaps. While the first week is uncharacteristically hilly, the key stages are at the back end of the Vuelta: specifically, Stage 15 on 12 September to Lagos de Covadonga, Stage 16 to Cortobello, Stage 17’s 46km pancake flat ITT at Penafiel and, the penultimate test, Stage 20 to Bola del Mundo.